• "As Easy as A.B.C.," by Rudyard Kipling (first published 1912 in London Magazine), the second of his "airship utopia" stories, envisions a twenty-first century world founded on free travel, the rule of law, and an inherited abhorrence of crowds. Officials of the Aerial Board of Control are summoned to the remote town of Chicago, which is convulsed by a small group's demands for revival of the nearly forgotten institution of democracy. • "Sam Hall," a short story by Poul Anderson (first published 1953 in Astounding Science Fiction): A story set in a security-obsessed United States, where computerized record-keeping enables the creation of a panopticon society. The insertion of a false record into the system leads to unintended consequences. Anderson, the first sf author to be honored with a Special Prometheus Award for Lifetime Achievement, explores political implications of computer technology that now, decades later, are widely recognized. • "Harrison Bergeron," by Kurt Vonnegut (first published 1961 in the Magazine of Fantasy and Science Fiction), a dystopian short story, set in a United States where constitutional amendments and a Handicapper General mandate that no one can be stupider, uglier, weaker, slower (or better) than anyone else, satirizes the authoritarian consequences of radical egalitarianism taken to an extreme that denies individuality and diversity. Vonnegut dramatizes the destruction of people's lives and talents and the obliteration of basic humanity via a denial of emotions and knowledge that leaves parents unable to mourn a son's death. • "Conquest by Default," by Vernor Vinge (first published 1968 in Analog), Vinge's first exploration of anarchism, offers a story about human civilization being overwhelmed by a superior alien force, told from the point of view of an alien sympathetic to the underdogs, who finds a way to save the humans by breaking up governments into much smaller components. The alien culture uses a legal twist to foster extreme cultural diversity, as characters draw explicit parallels between the plight of humanity in the face of superior alien tech and the fate of Native Americans faced with European invaders. 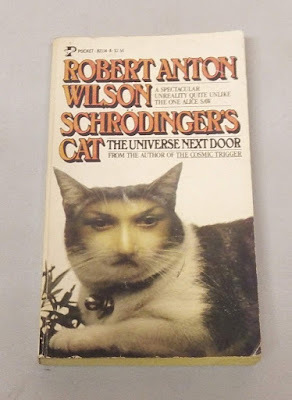 • Schrödinger's Cat: The Universe Next Door, by Robert Anton Wilson (first published 1979 by Pocket Books), a parallel-worlds novel, draws upon theories from quantum mechanics to explore themes about the evil of violence, particularly political coercion and the carnage of the Vietnam War. The speculative fantasy features alternate versions of characters from the Illuminatus! trilogy by Wilson and Robert Shea, which won the Hall of Fame Award in 1986. In addition to these nominees, the Hall of Fame Committee considered nine other works: "The Man Who Sold the Stars," by Gregory Benford; "ILU-486," by Amanda Ching; The Mirror Maze, by James P. Hogan; That Hideous Strength, by C.S. Lewis; A Mirror for Observers, by Edgar Pangborn; A Time of Changes, by Robert Silverberg; Daemon and Freedom, by Daniel Suarez, as a combined nomination; The Once and Future King and The Book of Merlyn, by T.H. White, as a combined nomination; and "Even the Queen," by Connie Willis. Tough choice! That Vonnegut story seemed so over the top when I first read it 40 years ago (it’s much older than that), and now it’s seems to be mere satire of the current zeitgeist. Schroedinger’s Cat of course is a nice hunk of awesomeness.